With the voice of a goddess, it’s no wonder Liz McCartney is a Bistro Award Winner for her one woman show “Rosemary and Time, a musical tribute to Rosemary Clooney.” Liz has been a fixture on Broadway starring in the Tony Award winning revival of “South Pacific,” “Mamma Mia,” “Thoroughly Modern Millie,” “Taboo,” “Dance of the Vampires,” “The Phantom of the Opera,” and “Les Miserables.” Audiences around the country have also been dazzled by the talent that is Liz McCartney. Her regional credits include “Working” at the Asolo Repertory Theatre with new material added by Tony Award winner Lin-Manuel Miranda, “Souvenir” at George Street Playhouse, and “Pirates!” at the Paper Mill Playhouse. 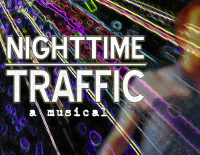 Currently, Liz can be seen lighting up the stage in “Nighttime Traffic” as part of the NYMF festival in NYC through October 10. For much more on Liz, be sure to visit http://www.lizmccartney.com. 1. Who inspired you to become a performer? I always knew I wanted to perform. I am the youngest of four children and percentage-wise most performers are the youngest in their family. 3. Who is the one person you haven’t worked with that you would like to? I worked with George Hearn twice, so I think the only other person is, Angela Lansbury. 4. If you couldn’t be doing what you are doing now, what career would you choose? It would have to be something creative, designing, or writing. 7. Starbucks or Dunkin’ Donuts? What do you order? Starbucks…Dunkin Donuts has started tasting funny over the years. 9. Favorite website? YouTube…I’m a YouTube junkie! 10. Superman or Wonder Woman? Wonder Woman all the way. 11. What is the best advice you’ve ever received? Never try and guess what they want…and never use an audition for practice! Oh yes, and this one is the MOST IMPORTANT…Always be nice to the monitor, you never know who they’re friends with. 12. If you could dream about anyone while you sleep, who would it be? Antonio Banderas…during Zorro…the first one, I didn’t like the sequel when he got his hair straightened!